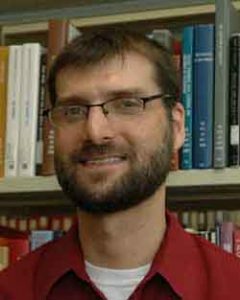 When he traveled to the nation of Qatar along the Persian Gulf this fall, Dallas Long brought along a vital treasure—his knowledge of libraries. 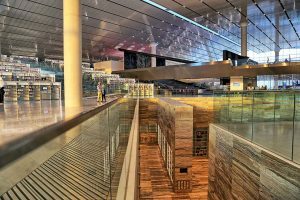 An associate dean of Milner Library, Long made the journey to help launch the Qatar National Library—the first, large public and research library in the small country’s history. Historically, libraries in the Middle East were known more as repositories, either for government and legal documents or for manuscripts and antiquities. The concept of a public library, where resources are accessible to all patrons, is a relatively new one. 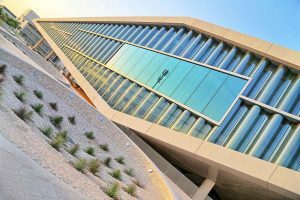 The recently completed library, located in Education City, follows the architecture of Qatar that combines ancient and ultramodern. A sparkling glass exterior leads to an open floor plan with shelves of marble. The interior of the new Qatar National Library. Image by Carlo Zappa, senior communications consultant at Qatar Foundation. Exterior of the new Qatar National Library. Image by Carlo Zappa, senior communications consultant at Qatar Foundation. Now that he has returned to the United States, Long still keeps in touch with the staff of the Qatar National Library, answering questions via email. And scholars at the nearby Qatar University have also reached out. “I can see myself going back if they feel they need me,” said Long, ready to bring his treasured knowledge back to the Middle East.